You may have decided that you want to start raising chickens so you have your own healthy fresh eggs or maybe you gave chicks to your children for Easter. 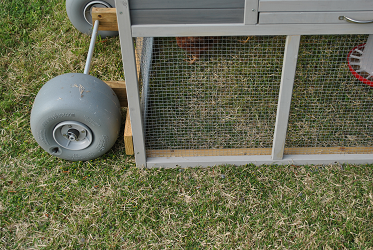 Now where do you put your chickens and how do you keep them corralled? 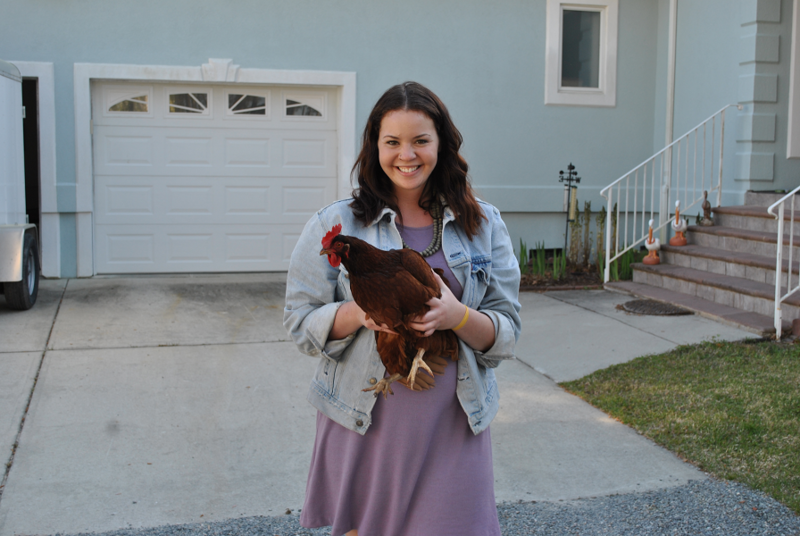 Living in an urban environment can be challenging to keeping chickens or for that matter, most anything that you would consider from an agricultural standpoint. 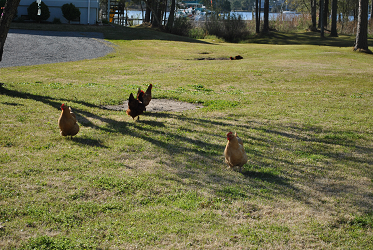 Chickens can exist in a city environment and thrive quite well. One of the keys to the chickens thriving is making sure that they are not a meal for the neighbor’s dog or other potential predator. As much as we love chickens, so do many other animals that would love to make a meal out of them. To help prevent this a chicken coop needs to be placed where the chickens can be safe and have a place to roost away from harm. Since chickens have become popular to raise in the city or urban areas, chicken coops have become more available in many different styles, shapes and sizes. I have had an interest in the mobile type of coops so the chickens can help with bugs in the yard and in turn the eggs will have that deep yellow yolk that taste so good from ranged chickens. This particular coop was purchased and modified to be mobile. 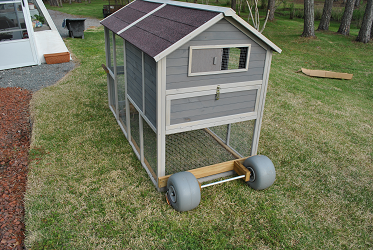 Handles were added and wheels to the back of the coop. 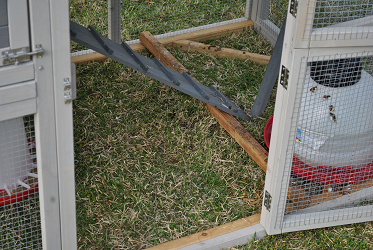 Along the base, reinforcement was added to help keep the chicken coop from damage when moved. This is a good design and modification. 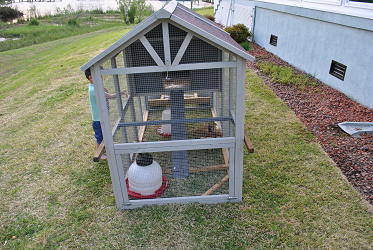 One to two people can move this coop and provide the chickens with new grass and bugs to eat. 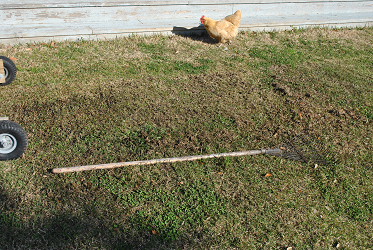 We all know how quickly grass will disappear when a coop is stationary. Roughly a year later I was able to go back and see the chicken coop that was featured in the article Urban Chickens. The chickens looked like they were really enjoying life. The are producing large rich eggs and the location that the chicken coop occupies receives a dethatching and a dose of fertilizer. 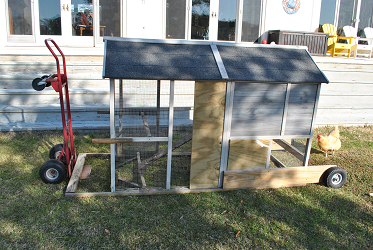 The coop has been modified slightly for the needs of the chickens and the owner. The wheels have been changed out and additional supports and wall boards placed. The roost area has been changed to use trays for the chickens to roost in, even though they tend to only lay eggs in the corner back pan. 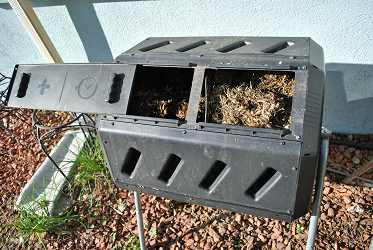 Another item that has been added is a rotating composter for the material that is cleaned out from the area that the chickens roost in. If you would like information on composting, please just click on the yellow tab for a free composting guide. 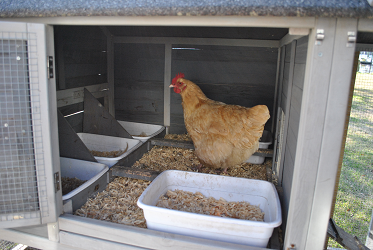 As you can see, this chicken coop design fits the bill for the chickens in this environment. In some locations you will not be able to let them have as free of an open range as these lucky birds have. In a future article I will discuss chicken netting and fences that are used to keep the birds corralled. Until then, enjoy your birds and all the good things they produce.